A December to forget for U.S. equities saw the major indexes reach bottom-feeding levels, but as investors headed for the exits in stocks, a number also sought the entrances for bond funds--particularly of the short-term Treasury variety. "Demand for US equity ETFs has been diminishing. The liquidity outlook for US equities remains downbeat. Our indicators remain neutral for the short term and outright bearish for the intermediate term," David Santschi, TrimTabs' director of liquidity research, said in a note on Monday. Near the end of 2018, the influx of capital into a tech sector that fueled the extended bull run that saw historic milestones reached by the S&P 500 and giants like Apple cross the $1 trillion valuation mark, would come to a halt. The whipsawing of volatility put investors through an economic wash cycle that wrung out the notion that simply staying invested would generate returns--this was not the case as the market fluctuations in the last few months of 2018 shifted investor mindsets from risk-on to risk-off. 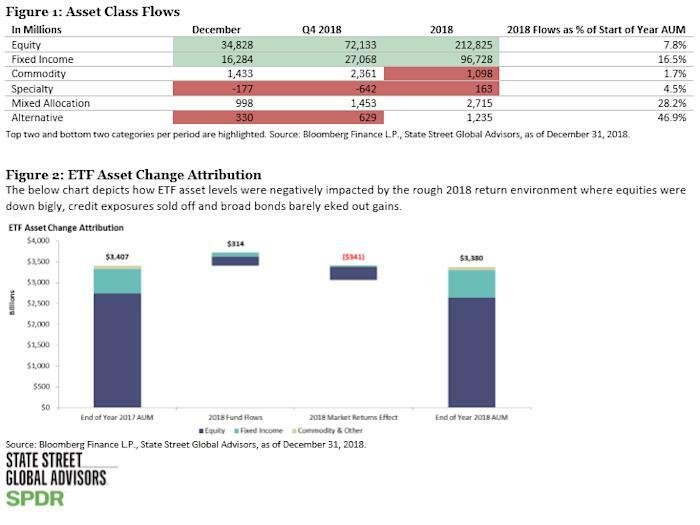 This shift was evident in the latest State Street Global Advisors (SSGA) report that showed a renewed interest in fixed income, particularly safe havens like government debt, but all in all, fixed-income ETFs benefitted across the board. December, in particular, saw over $16 billion in flows--good for its second highest monthly inflow of all time. Looking at fixed-income ETFs more closely, investors cornered specific areas of the bond market, such as short-term and ultra-short maturities, which saw the lion's share of flows. With ultra-short government bond ETF cumulative flows moving past the 200-day moving average of the S&P 500, the shift to risk-off was readily apparent. Investors can take advantage of this risk off shift by looking at short-term Treasury ETF options, such as the iShares 1-3 Year Treasury Bond ETF (SHY) and iShares Short Treasury Bond ETF (SHV) . Both funds offer core exposure to safe-haven Treasury notes, but at the same time, addresses duration risk by offering short-term exposure to government debt. Debt holdings in SHV mature between one month and one year, while those in SHY range from one to three years. According to data from XTF, both funds have seen inflows of almost $7 billion as of Jan. 4, taking the top two spots for net inflows into ETFs.